Lockheed Martin has submitted a proposal for the U.S. Air Force’s GPS III Follow On (GPS IIIF) program, which would add new capabilities to new GPS satellites. Up to 22 next-generation spacecraft are expected to be produced under this program. The first 10 of the Air Force’s GPS III satellites are currently being assembled at Lockheed Martin’s GPS III processing facility near Denver. The $128 million facility was designed in a virtual reality environment to increase efficiency and reduce the costs of satellite production, the company said. Lockheed Martin said the new GPS IIIF satellites will utilize a fully-digital navigation payload, while the first 10 GPS III satellites have a payload that is some 70 percent digital. GPS has helped revolutionize navigational services. The GPS III fleet is designed to increase accuracy some three times and anti-jamming capabilities some eight times. These satellites have a planned mission life of about 15 years—25 percent longer than the newest GPS satellites in service today, Lockheed Martin said. Thanks to the satellites’ L1C civil signal, the company said the GPS III satellites will be able to interact with other international global navigation satellite systems, such as the European Galileo system. The GPS IIIF satellites are expected to be equipped with a regional military protection capability, which is intended to increase anti-jamming support and ensure that that U.S. and allied forces cannot be denied access to GPS in hostile environments. Additionally, Lockheed Martin said every GPS IIIF satellite will include a laser retro-reflective array, which would allow the satellite to be positioned with ground-based laser precision, enhancing the accuracy of the positioning signals they generate. The U.S. government is expected to provide each GPS IIIF satellite with a new search and rescue payload, which would be spread around the globe, Lockheed Martin said, and is designed to make it easier for emergency signals to be detected by first responders. Lockheed Martin’s first GPS III satellite was declared “Available for Launch“ (AFL) by the Air Force in September 2017. GPS III Space Vehicle 01 (GPS III SV01) is currently in storage awaiting call up for launch. GPS III SV02 finished Thermal Vacuum (TVAC) testing in December 2017, and currently undergoing final environmental testing. This satellite is expected to be declared AFL in summer 2018. 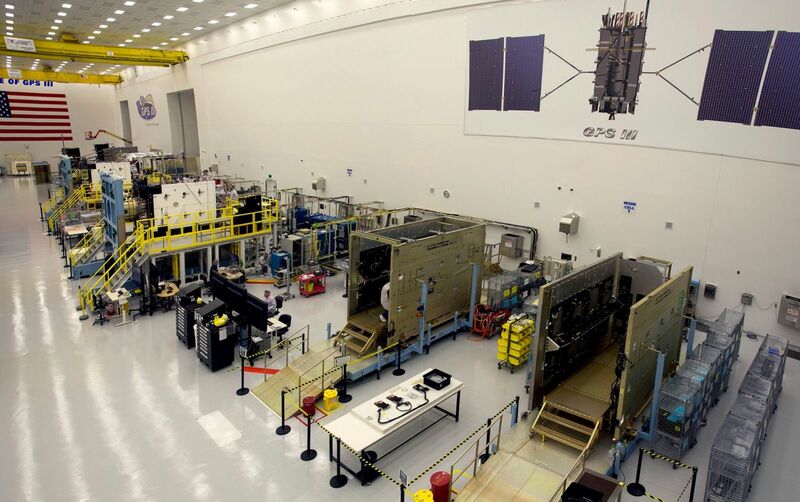 As for the next satellites, GPS III V03 recently began TVAC, Lockheed Martin said, and SV04 was recently integrated and is expected to begin environmental testing this summer. GPS III SV05 has received its navigation and is currently in final vehicle build up. GPS III SV06 has begun its initial build and GPS III SV07 is expected to begin production later this spring (2018). Lockheed Martin said over 90 percent of the parts for all 10 GPS III satellites have been received from over 250 aerospace companies in 29 states.